After seeing a lot of posts regarding loose holographic flake glitter, I decided to try out some for myself. Today’s product comes from Beauty Big Bang, and it shipped to me in less than 3 weeks from the day I ordered it. It’s not exactly instant gratification, but it was insanely fast considering that it comes from China, and shipping was free. The packaging is fairly simple. The holo flakes are contained in a small plastic jar which is placed inside a zip sealed bag. Also included is a dual tipped sponge applicator that is similar to the kind that you would find in an eyeshadow compact. The real beauty of the glitter isn’t apparent until you open up the container. This is best done over a piece of paper or a paper towel because loose glitter can get messy quickly. In any case, the flakes are truly holographic and not just silver. They catch the light and have rainbow reflections. As indicated by the name of the product, the glitter consists of both fine particles as well various sized flakes. The biggest flakes are no bigger than 2 mm, and all the pieces are attractively irregularly shaped. 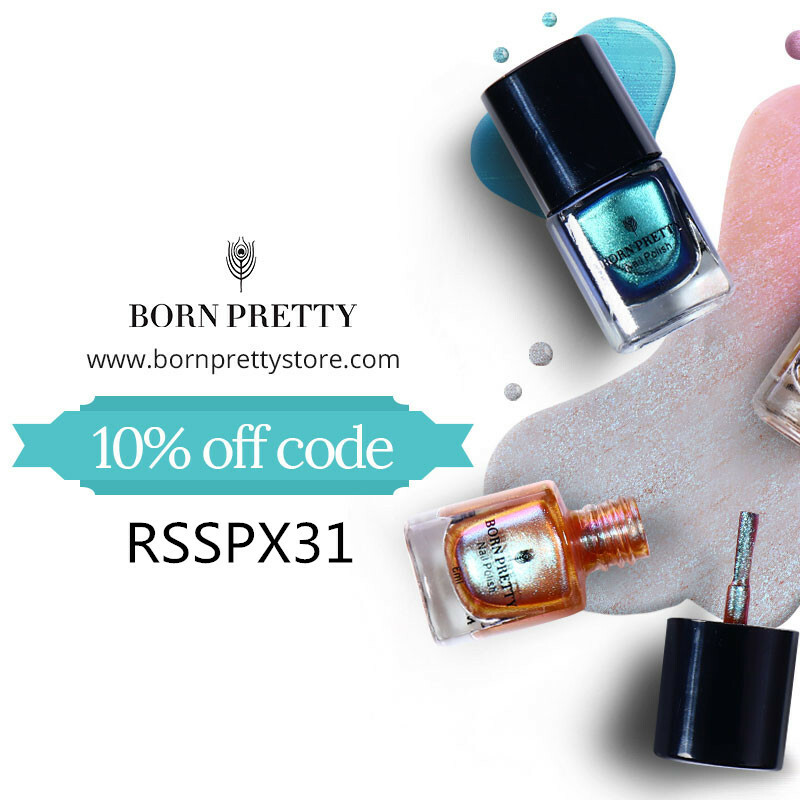 This variety is perfect for making an easy galaxy manicure and looks great when used either generously or sparingly. My only complaint is that you only get 0.2 grams of the glitter in the package. A little does go a long way, but the container is definitely not filled to the brim with glitter. This does make it easier to open and use without spilling the product on everything, but just like with a bag of potato chips, you somehow feel a little cheated. That’s what you get when a product is sold by weight and not volume. You can use the flakes in a few different ways. One is to pour a small amount into a bottle of clear top coat to make your own holographic top coat. Another would be to paint your nails and then sprinkle the flakes onto the polish while it is still wet. I chose to use a gel top coat to apply the flakes, which is the suggested method on the Beauty Big Bang website. I decided to use regular nail polish as a base as I don’t enjoy removing gel polish from my nails. I went with a basic black color to really make the holo flakes stand out. What’s A Tire Jack by Sephora by OPI is one of my go to black polishes. After the polish was dry, I applied a gel top coat from Born Pretty to my nails and cured it under a lamp for about 10 seconds. 30 seconds is the amount of time that it takes to fully cure the polish, so my aim was to still ensure that the top coat was sticky enough to let the holo flakes adhere to the surface. Generally you will want to cure this layer for no more than half the normal time to guarantee that the glitter will stick to your nails. I then took the sponge tipped applicator and dipped it into the pot of glitter and patted it onto the sticky top coat. I repeated this process a few times until I was satisfied with the look, then applied another layer of top coat and cured it for the full recommended time. You can use a fan brush to remove any extra glitter from your cuticles or simply wash your hands after your top coat has cured. That’s all there is to using this product! Beautiful holographic flakes make a manicure look out of this world. Loose glitter is always a welcome addition to a nail artist’s stash because of its versatility. This one is beautiful and easy to use, and it looks very unique. As stated before, a little bit goes a long way, so you can get a few manicures out of this. If you’re a holosexual, you will definitely want to purchase this product right away! If you are interested in purchasing this nail glitter SKU:J2425 (retail price is $5.99 USD), the link for the item is shown below. 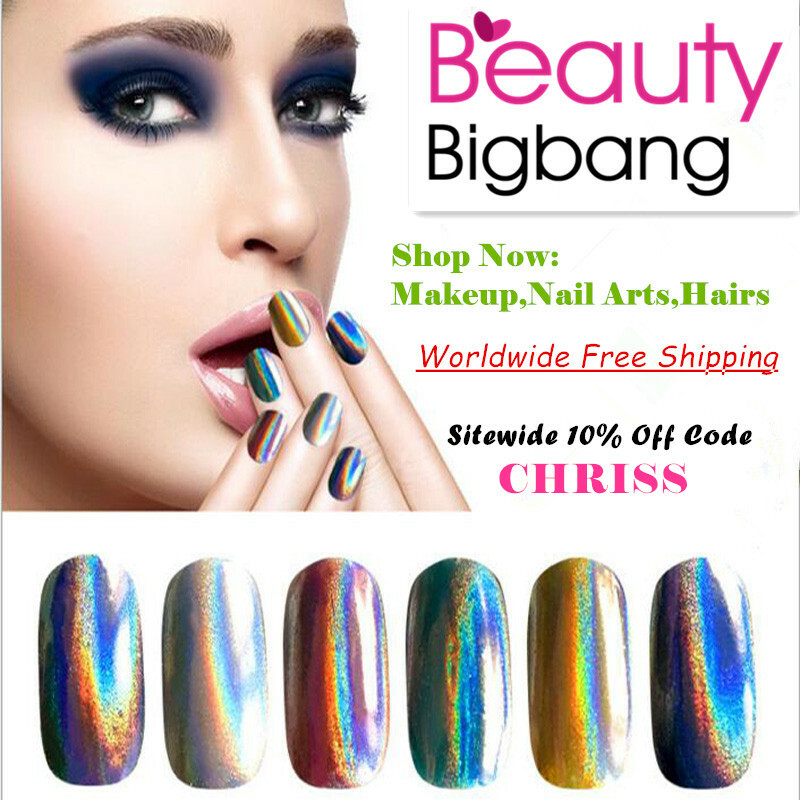 Using code CHRISS will get you 10% off your order, and Beauty Big Bang offers free worldwide shipping. Happy polishing! This entry was posted in 2017, classy, gel polish, glitter, holographic, july, manicure, nail art- easy level, review, summer, tutorial and tagged beauty big bang, born pretty soak off gel top coat, coupon code, galaxy, galaxy holo flakes, glitter, holo flakies, holographic, holosexual, j2425, mani, manicure, nail art, nails, notd, review, sephora by opi, tutorial, what's a tire jack.